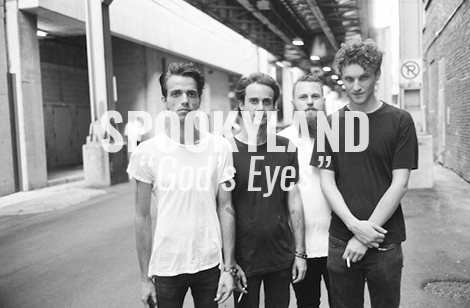 When people ask me where the best music is coming from these days, I’m still saying Australia, as I keep hearing new sounds like today’s track from Sydney band Spookyland. Take a look at the video for “Big Head” off the upcoming release of Beauty Already Beautiful. The driving force behind the band is 23-year-old singer and songwriter Marcus Gordon. Wrangling profanity, twisted beauty and a fascination with life’s paradoxes into his songs, Beauty Already Beautiful is 11 dynamic and often epic songs in which the singer takes a scalpel to experience, exposing his own frailties and hurt while also laying bare our collective fatally flawed nature. Expect to hear “big songs with a do-or-die feel that recall Springsteen, off-centre ballads with echoes of Dylan and occasional moments of folksy rollicking that suggest The Pogues”. The album was recorded in Omaha, Nebraska and produced by Tony Buchen at the Saddle Creek compound, where Spookyland lived while they worked. Take a look and keep an eye out for this record.